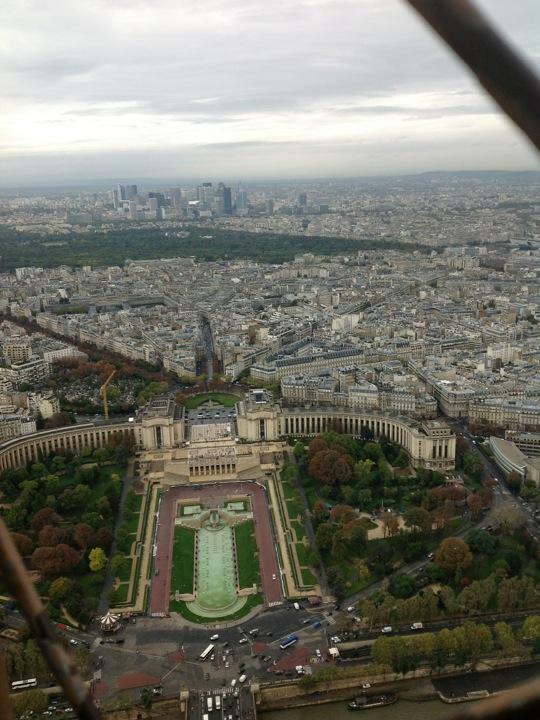 Today we went to the Eiffel Tower. We walked under the middle and bought our tickets to the top. We waited in line for about five minutes. When we reached the turnstiles a lady pulled off one side of our tickets. After we went through the turnstiles the elevator came down it had a manikin to show how they use to run it from the outside of the car in the old days. The elevator was two stacked on top of each other so the people could get in on the top or the bottom. The track started horizontal stopped at the first floor then became vertical. When we reached the second floor we got off and waited about 10 minutes in line and then proceeded to the next elevator to the top. This one looked like a normal hotel elevator, but it had a driver to take us to the top. When we were going up the sides were glass so we could see out. It was cool and terrifying at the same time you could watch the sides shrink as we got closer to the top. my ears popped because it was so high. The elevator stopped at the top I could not believe that we were 381M high that is 1,143FT high. There was a large holed fence so that you would not fall out if you leaned. When we walked around the top it gave us a great view of Paris. This was cool because it was the highest structure I have been on and it was my parents and I first time the Eiffel Tower.